Easter is creeping up on us, and it’s a time to celebrate and allow yourself to enjoy some healthy chocolate treats. This recipe is raw, vegan but high protein and uses a base of chia seeds which have been scientifically proven to trigger weight loss, prevent and treat disease such as premature ageing, heart disease, arthritis, bone health and much more, and raw cacao; a great chocolate substitute, high in antioxidants that can also slow aging, boost brain health and increase the happy hormone, serotonin too!! Pour the chia seeds into a bowl and add the water, stir so no clumps form, then set aside for 10 minutes to allow it to form a gel. Stir once more, add all other ingredients, place in your http://www.vitamix.com.au blender and whip up for 1 minute or until all ingredients are mixed. Pour mix into a glass or ceramic bowl, cover and refrigerate for 6 hours until it sets. 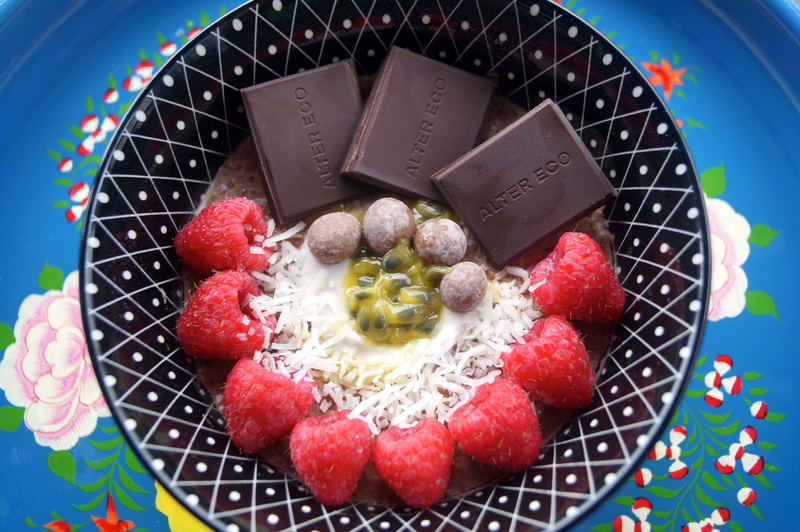 Serve with fresh berries, blackberries, and raw dark chocolate for Easter, coconut, passion fruit and raspberries.